Interracial adoption, also called transracial adoption, has long been a controversial issue, even among among avid adoption advocates. Adopting a child of another race has benefits and disadvantages. If you're white, as most transracial parents are, it's easier to adopt a nonwhite child because more of them are available for adoption. Adoption is a lifelong commitment that affects your entire family, especially your adopted child. It's important to look past the adorable faces and really think through the pros and cons of interracial adoption. Worldwide, it's often easier to adopt black, Asian and Hispanic children than white children. About 24 percent of adopted children in the United States are adopted by relatives. About 40 percent of the other 76 percent of adoptees, either through domestic or international adoption, are a different race than their adoptive parents, according to a 2007 U.S. Department of Health and Human Services survey. 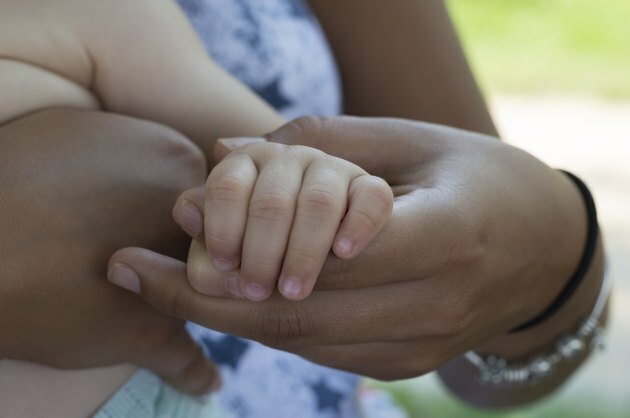 If adoptive parents want a white newborn, the wait might be long and the costs prohibitive, compared to an international or domestic transracial adoption. While it's one thing to make up your mind to adopt a child of another race and declare that your parents or Aunt Sadie will just have to accept it, the reality is that, for many people, it doesn't make sense to lose a family to gain one. Many grandparents grew up in an era where races didn't mix; they might never have known a person of a different race. They might worry about how this will affect you, their child and your other children. Give your parents and family members time to get used to the idea rather than just springing it on them suddenly. In most cases, race will not be an issue once they get to know your child, according to the Adoptive Families website. When your child is young, he won't know or care if he has the same color skin as you. A baby just needs consistent love and care to thrive, not the same color skin or eyes as his caretaker. But when he grows, he might have many questions, concerns and even resentments about being part of a family he doesn't "match." One advantage of adopting a child of another race is that it's hard to hide the fact that your child was adopted. You will never have to wonder whether to "tell" or when to tell; questions about your differences will come up and give you an opening. When you're a transracial family, you will stand out. The United States is not a color-blind environment. People will approach you in the supermarket to ask about your child. Some will make unkind comments, others will treat you like a saint, gushing about the wonderful thing you did. Your other children will have a new identity as the sibling of a child of another race. As your child grows, he might feel the burden of standing out. A 1999 study published in "The American Journal of Orthopsychiatry" found that about 50 percent of Asian and black adoptees felt discomfort over their racial appearance. Parents who adopt transracially will need to take extra steps to ensure their child develops a sense of his racial heritage and pride in who he is. Time: Should Race Be a Factor in Adoptions?